Assistance League of Arcadia provides meeting space at our chapter house for seniors and the visually impaired in our community to gather socially. We serve three senior clubs in partnership with Arcadia Recreation Department and EYE-DAS for the visually impaired. 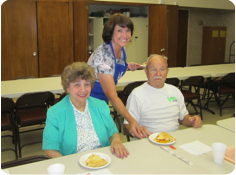 Activities include bingo, bridge, singing, lunch, and fellowship. For more information about programs for seniors call Arcadia Community Center 626-574-5130. For information about EYE-DAS call 626-335-3937.